Setting up a printer in OS X is often as simple as plugging it in to your Mac or connecting to a shared printer on the local network. From these simple cases, you probably know how to use the system’s Print & Fax system preferences pane to configure the printer. But there are a few other ways to connect and manage printers that you might not be so familiar with. While you can add a shared printer available to your system using the Printers & Scanners pane in System Preferences, you can also do so from the print dialogue in any document. 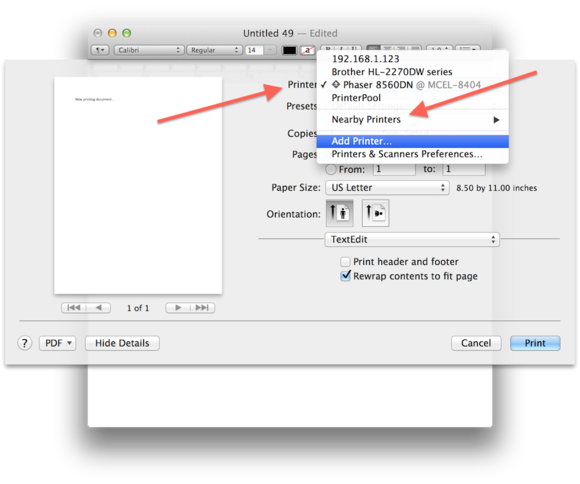 In the Printer drop-down in the standard Print dialog, you will see an submenu labeled Nearby Printers. Choosing a printer from that list will cause OS X to automatically install its driver and set it up for use. Clicking the Printers menu in the standard print dialogue box will give you options to add new printers, either those shared or otherwise nearby. In this way, you can quickly print to a number of different devices, instead of having to first ensure they’re set up in the system preferences. Note that these quick-access options are only available for printers using Apple’s Bonjour networking, and will not necessarily work for those with other communications technologies. There may be times when you have access to a number of different printers, both shared and locally available for your Mac. In these cases, it may be convenient to group them into printer pools. These pools create one virtual printing device from a number of available printers; the system then picks from one printer from among the available ones in the group to handle your print job. 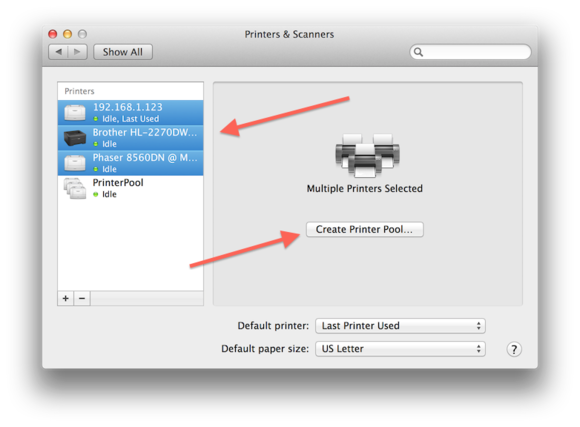 To set up a printer pool, go to the Printers & Scanners pane in System Preferences, then hold the Command key while clicking the various printers you would like to group together. With multiple printers selected, you will see a Create Pool button instead of the general information and configuration options for each printer. Once you have named and created the pool, it will appear in the list of printers next to the others, and be sharable on the network just like any other printer. Selecting multiple printers in the sidebar (in this case a networked printer, a shared printer, and a locally attached printer) allows you to group them into a printer pool, which serves as one virtual printing device that distributes print jobs among the printers in the group. Printer pools can be used in a couple of different ways. First, you can use it locally, where you create a pool on your Mac consisting of shared and local printers available to you, and then print directly to it. The second is to create this pool on another computer (such as a dedicated print server) and then share that pool on the network. Unlike the first option, which must be set up on each Mac separately, a shared printer pool will be available as a single device on the network that can be configured quickly. Using these options you can, for example, have a bank of printers in an office that are managed by a single Mac, which all employees print to through that one Mac. If one of those pooled printers is off-line, then print jobs will be distributed among the remaining online ones. The CUPS Web interface can be used to access advanced configuration options for your printers. This interface can be managed locally, and accessed through any Web browser by pointing it to port 631 on your system, by navigating to the URL http://127.0.0.1:631 or http://localhost:631. View activity logs: Your Mac has an error log and an activity log for configured printers, which you can use to troubleshoot printer problems or track down where print jobs came from. This can be exceptionally useful for system administrators; buttons to access these logs should be available in the Server section of the CUPS Administration tab. Allow or deny users print access: While you can define which users are allowed to access a shared printer in the Sharing pane of System Preferences, there is no way through Apple’s GUI to restrict local-user access to the printer. You can do this in CUPS. To do so, select the printer in the Printers tab, then choose Set Allowed Users from the Administration drop-down. Here, you can enter short usernames separated by commas, and then opt to allow or deny those users access to the printer. The CUPS Web interface gives you access to a number of advanced configuration options for your printers, print jobs, printer classes, and your system's print server. Add or change printers in printer pool: You cannot drag new printers into an existing printer pool in the OS X interface, but you can add and remove them in CUPS. To do so, click the Classes tab and then select your printer pool. Next, choose Modify Class from the Administration drop-down and, holding down the Command key, select multiple printers in the list of members. Clicking on the Modify Class button will change the printer pool configuration. Move paused print jobs to another printer: If you’ve printed to a printer and it is paused by an error or other oddity, you can then go to the Jobs tab in the CUPS Web interface, and click on the Move Job button to the right of the print job. Next, choose a new printer in the list and click the Move Job button to assign the job to that new printer. 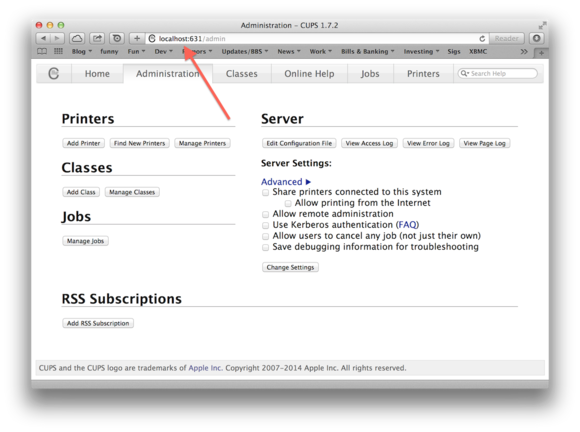 Subscribe to printing events via RSS: If you are an administrator, you can click the Add RSS Subscription button at the bottom of the Administration tab. In the next screen, you can select from a number of different events—including job starts, job stops, job deletions, and more—to view. Check the appropriate boxes for the events you would want to hear about, then name and create the feed. The URL to the feed will then appear on the main Administration page; clicking it will open it any standard RSS reader. When configuring your Mac’s printers, if anything goes wrong you can always reset the print system to revert the entire printer configuration back to a factory default setting. To do this, go to the Print & Fax system preferences, and then right-click the printer list. The contextual menu that shows up will have Reset Printing System option. Selecting this (and the confirming that you want to do so) will clear out all configured printers and have you set them up again from scratch.